Now that 4505 Meats’ chicharrones are such a runaway hit, their creator, Ryan Farr, can look back on the early challenges of selling and marketing his version of fried pig skins with an air of amusement. “If you’ve never had our chicharrones, you might have a bad taste in your mouth from eating pork rinds in the past,” he says, “so getting people to understand that pig skin can be a beautiful thing did take some initial effort.” Farr hails from Kansas City (a meat-loving town if ever there was one) and made a name for himself cooking in San Francisco restaurants such as Fifth Floor and Orson. Now he’s known as the visionary behind 4505 Meats, a new addition to the upcoming Thursday market. Farr keeps his chicharrone recipe under wraps, but he does disclose the fact that they’re fried in rice bran oil, making them extra crispy. Or as Farr lovingly says, “like porky funyuns that melt in your mouth.” Beyond the drive to develop “crunchy crack-in-a-bag,”* Farr says the idea to start making chicharrones was born out of a larger dilemma. “We had all this extra skin left after buying whole pigs and using every other part, but there’s not a lot of use for pig skins,” says Farr. 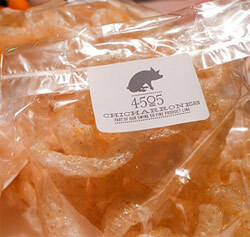 Now, the demand for Chicharrones has outpaced his need for the other parts of the pig, says the chef. So in recent months he’s been buying skins from the same local farms he’s always gotten pigs from — Marin Sun Farms, Prather Ranch, Devil’s Gulch Ranch, and Niman Ranch, to name a few. Speaking of guts, striking out on your own in an economy like this takes more than a solid product and sustainable practices. But making 4505 Meats his primary obsession since leaving Orson has allowed Farr to create a kind of persona in the world of slow and sustainable food. “I’ve always been really big into butchery, so I feel blessed that people are excited to learn how to butcher a whole animal and make sausage,” he says. Farr’s classes and demos have been selling out consistently for months and the blogosphere can’t seem to get enough. 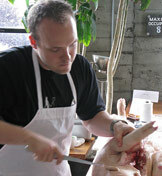 A Google image search reveals a grid of similar photos of this chef carefully dismantling, categorizing and explaining one pasture-raised pig after another. In each photo, Farr is focused squarely on the animal — and it becomes clear that the popularity of his products is no accident. * Marcia “the tablehopper” Gagliardi’s term.